Welcome to the Ireland Chapter of the PMI Podcast. 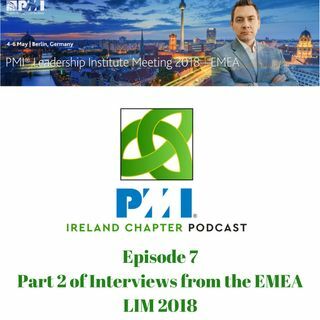 In this episode, I share out more interviews with PMI Chapter members, PMI Board Members & PMI Employees, all recorded at the Leadership Institute Meeting (LIM) in Berlin back in May. Hear from PMI Board Member Cecil White on his role within the PMI, as well as chapter presidents and members from Belgium, Lithuania, Sweden, Poland, France and others. The topics discussed include ... See More the value of being a member of a PMI Chapter, learnings from the LIM and future plans for the PMI.